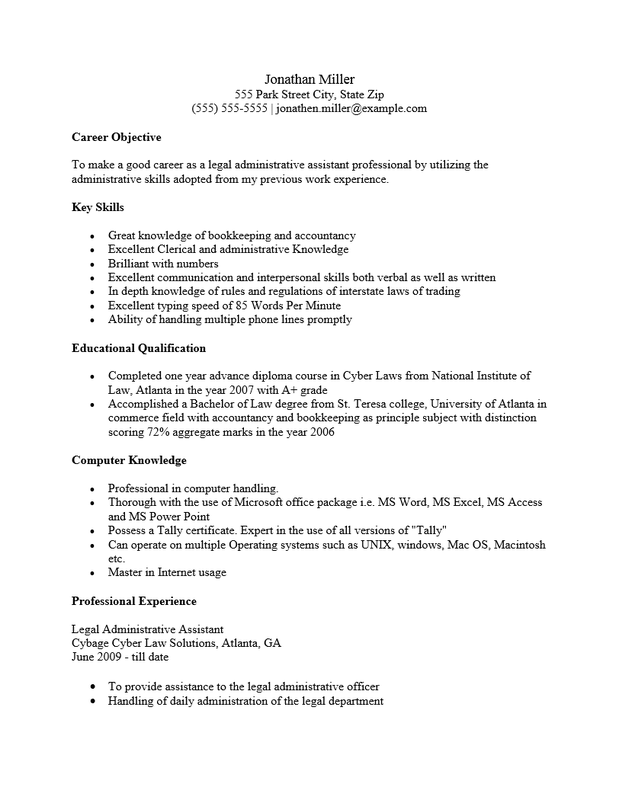 The Real Estate Administrative Assistant Resume focuses its attention on the real estate industry. Candidates wishing for administrative assistant positions will have to demonstrate a clear understanding of both real estate terms and office procedures. In addition, they must have the ability to communicate clearly at all times. The content that an applicant uses on their resume should espouse all of these qualities plus quite a few more. Obviously, in order to produce a professional looking resume with so much information, one must have spent some time on it and must have it clearly structured. The Real Estate Administrative Resume Template will provide the structure while the user provides the content. In most cases, a top quality resume will result in an in person job interview. Step 1. Input your Name and Contact Information at the top of the page. This should be as clear and easy to read as a business card. It is customary to have this information centered however not required. Some may suggest to bold the name or enlarge the font. This, too, is a matter of personal preference. Step 2. Compose one to three statements which clearly inform the reader why you are sending them a resume. Attempt to give a general impression of why you would be a good hire. This is will act as a clear demonstration of your ability to communicate concisely and hopefully entice the recruiter to continue reading. These statements should be in the “Objective” section. Step 3. The “Summary of Skills” section will be a straightforward list which should support the statements you made in the “Objective” section. This is your chance to clearly define your capabilities and strengths to the potential employer. It would be a very wise idea to reread the job listing you are answering and compose a list that addresses the requirements within the posting. Step 4. “Work Experience” is a straightforward list of your employment history. Recruiters will want to know who you worked for, where you worked for them, what you did for them, and how long you worked for them. The first line of each employment profile should give that employer’s name, city and state, and date range of your employment. The next line should be the official job title you held and below this will be where you give a detailed description of your accomplishments or responsibilities. Step 5. 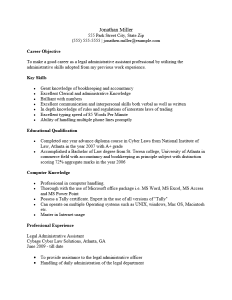 The final part of this resume template will be the “Education” section. Here, list the degrees or certificates. For each you state what degree or certificate you earned is, the institution, location, and date you earned them.